Create wireframe 3D animations in After Effects, in the style of vector graphics video games from the glorious ’80s. This template file requires After Effects CC 2018, and uses no third-party plug-ins. The template is free, so the only cost is your sanity. You might want to pick up some graph paper though. VectorKit is an After Effects Template (.aet). Open it like a project file, and it creates a new copy that you can save with its own name. Start with the tutorial. Open the Tutorial comp and step through the frames, following the instructions as you go. You build things in VectorKit by duplicating Segment layers and modifying their Point A and Point B X, Y, and Z coordinates. Create new materials by duplicating the Material layers in the comp. Each Segment has a menu where you choose its material. Materials have settings for color, brightness, and even some animation settings like Birth and Death Brightness. That’s how the segments in the VectorKit logo animation above “pop” on brightly and then fade down to their normal brightness. Every Segment needs a 3D Parent Layer. This is usually a 3D null, and you can animate the VectorKit object by animating this null. 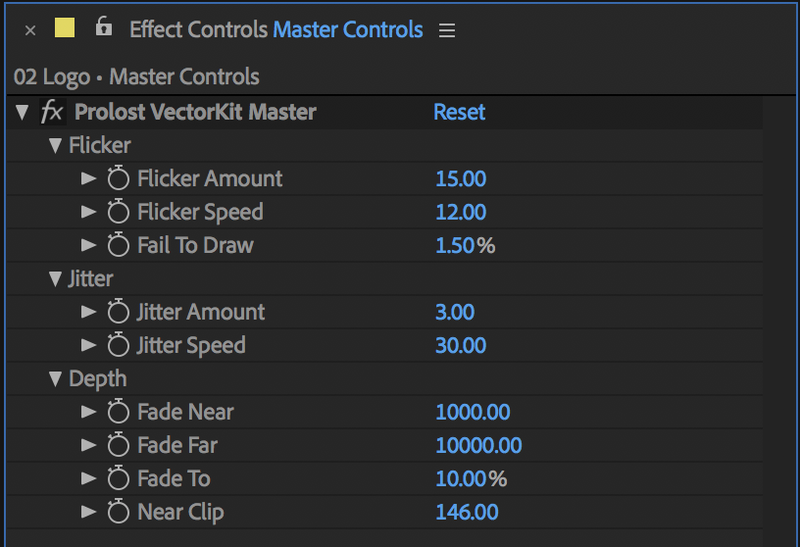 The Master Controls layer has settings for Flicker, Jitter, and “Fail To Draw”, which determines the likelihood that a Segment will be invisible on a single frame. There are also controls for depth fade, and Near Clip. Start your own VectorKit project by duplicating and modifying one of the sample compositions. If you need to change the composition size, make sure to change the size of the solids used in the Segment layers to match. 2018-06-04 Version 1.5 changed to use shape layers instead of Beam effects on solids. Expressions exposed.